Well dagnab it. I'm back to posting links until IMGUR will load the pictures. It's temperamental, isn't it? Omg Moonflame!!!! Those are gorgeous!!! Erinaquaheart, those treats are positively mouth watering, and those scrapbook pages are adorable. GO KATIEBREAD!!!!! Not gonna lie. I have a Sterlite tub FULL of dolls I want to faceup. I have all the tools. I even have the Mr. Clean sealant. I'm too scared to try. *knocking knees* YOU ARE THE BOMB!!!! Brief Description: A zen garden transforms as part of its use as the sand goes from flat surface to lined by the rake. 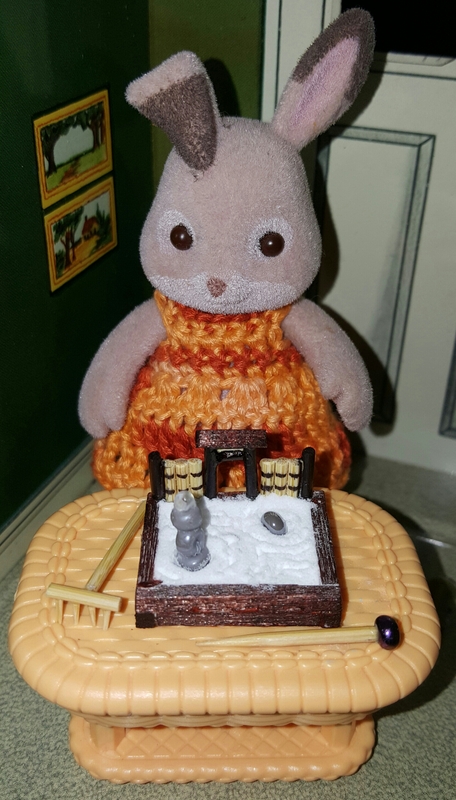 I enjoyed transforming toothpicks and matches into a little table top zen garden for my dollhouse, and transforming beads into a tiny statue for it. Guadiknight. That calendar is adorable, and your tiny dresses are always so gorgeous. Brief Description: I picked up a package of tiny strollers at the dollar store. I used the best one and the most squashed one for this project. I took the wheels and push bars off then removed the chassis with a drimel and an exacto knife. I robbed the band from the squashed stroller's hood for the mobile for the bassinet. The mobile is embroidery thread and circles stamped from a sheet of felt. 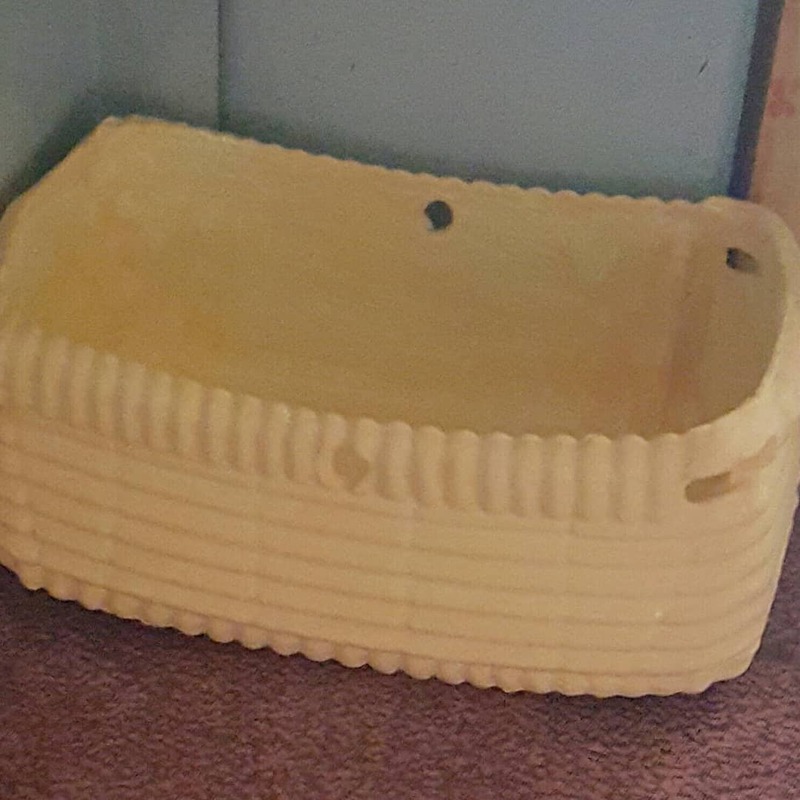 I used thick cardboard, several layers of paper towel, and fabric to make a tiny fitted matresses pad. I'm learning to use fabric glue. I painted the squashed stroller yellow as all of the walls in my dollhouse have some degree of yellow. I need to learn how to use gesso to prime plastic. 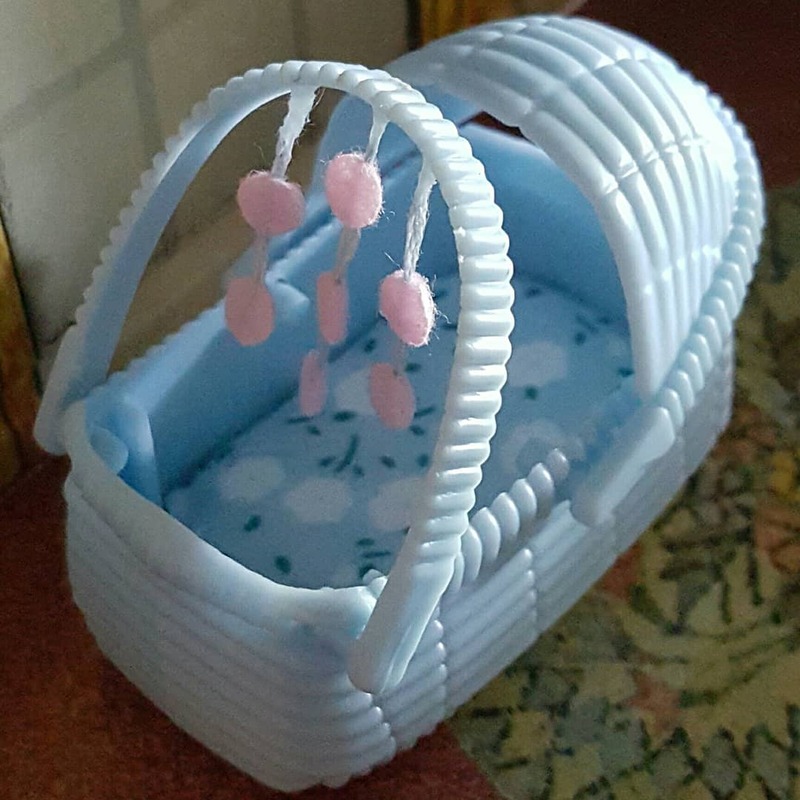 Thus I adapted 2 baby shower favor strollers into a bassinet and a laundry basket for my dollhouse. Brief Description: This afghan did not want to be made. For such a simple pattern I had to frog it countless times. But I managed, by following the pattern closely, to knit this baby afghan on toothpicks for my dollhouse. I need better lighting in my room. The embroidery thread I used to knit this is so much prettier than it looks in this picture. It's a beautiful colorway of pink through blue. Perfect for a baby blanket. *blushes* Thank you, Inselaeffchen. I followed back. I love that backdrop, katiebread!!!! That's beautiful!!! 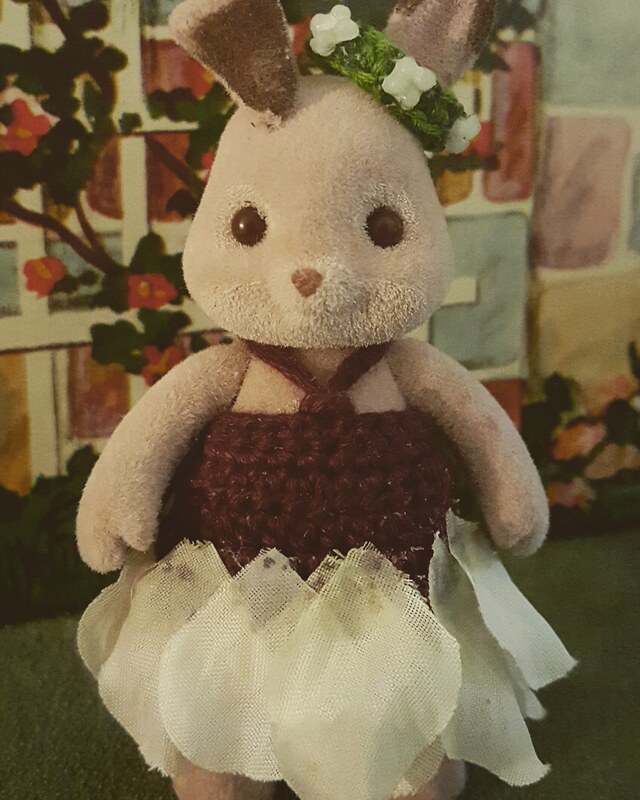 Brief Description: Using embroidery thread and faux flowers I made Flopsy a flower fairy costume for this Halloween. Brief Description: Yesterday was AnnoyingLittleBrother's birthday. I had him save me some of the wrapping presents to make presents for the dollhouse from. I started by making cardboard boxes to wrap, and then realized they could easily be crushed so I dismantled them and stacked cardboard pieces, gluing them together. 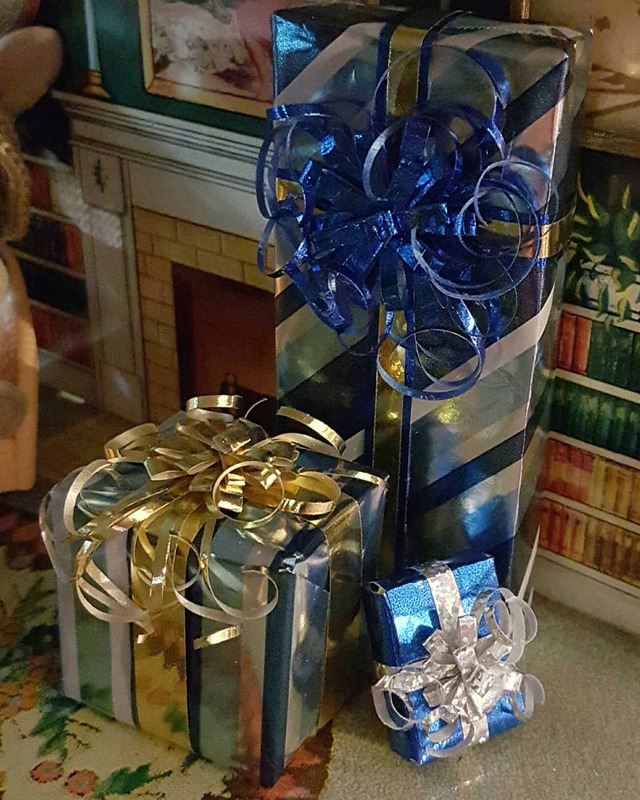 I then wrapped the boxes with the wrapping paper and decorated the packages with ribbon cut down to size. And then I learned how to make bows...... (Omg the bows take FOREVER) SO thankful for Pintrest. Brief Description: According to Wikipedia, a Dovecote is a structure intended to house pigeons or doves. Having been around since at least Ancient Egypt, Dovecotes were built directly into the upper walls of farmhouses in Brittany. The homing pigeon was selectively bred from rock pigeons for it ability to find its way back to its nest over extremely long distances. This enables homing pigeons to be used to carry messages. 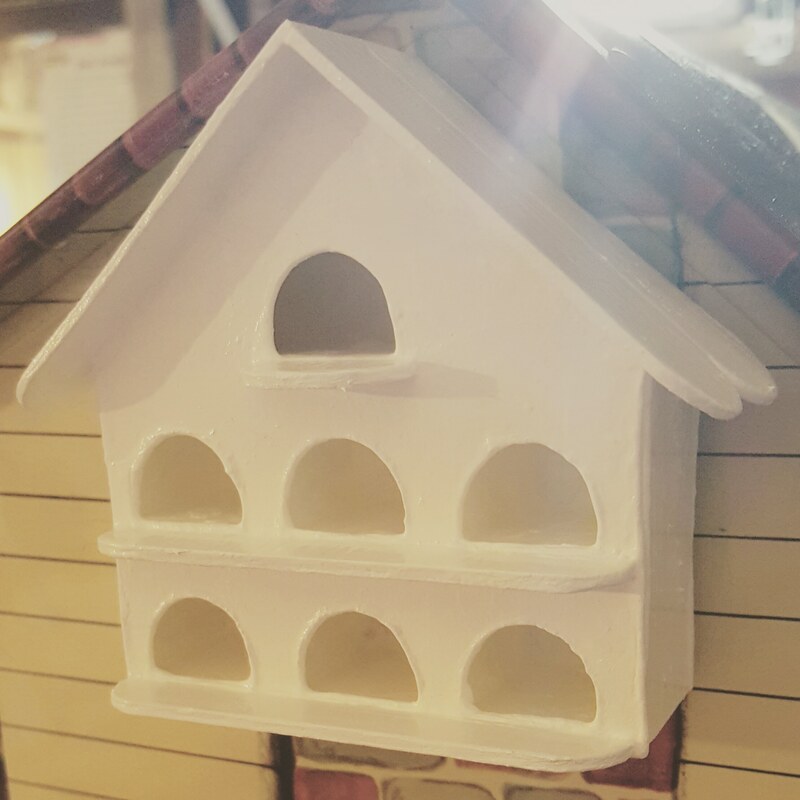 I built a lovely dovecote to hang near the rafters of the dollhouse. Jellybean89 OMG That alpaca is GORGEOUS!!!! And I LOVE it's poncho!!!! Brief Description: Once I knitted the little swatch for Flopsy last semester AnnoyingLittleSister has been after me to knit a Calico Critter baby blanket. I knitted this on toothpicks in the suburban on the way to the library in the next town over, and while we were there. Brief Description: Summer in Texas is bright. Very bright. 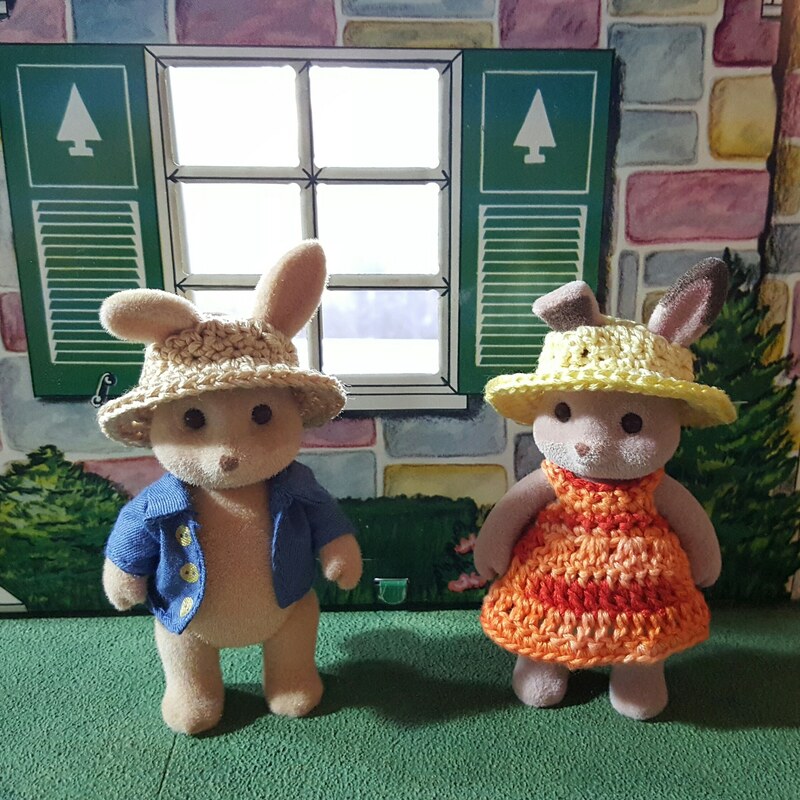 No one goes outside without a hat, even Calico Critters, so I crocheted gardening hats for Peter and Flopsy. I am having the hardest time getting my descriptions to paste. :/ Anyone else having problems or is it just me? 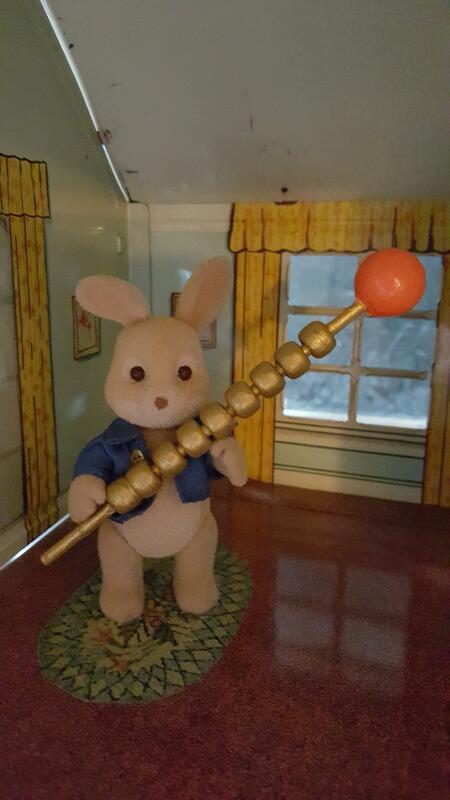 Brief Description: I'm not sure, as creepy as Peter is, he really NEEDS a melt stick, BUT it is definitly the kinda brass colored thing with a sphere on it that should be found in the umbrella basket in the corner by the door of a geek's doll house. 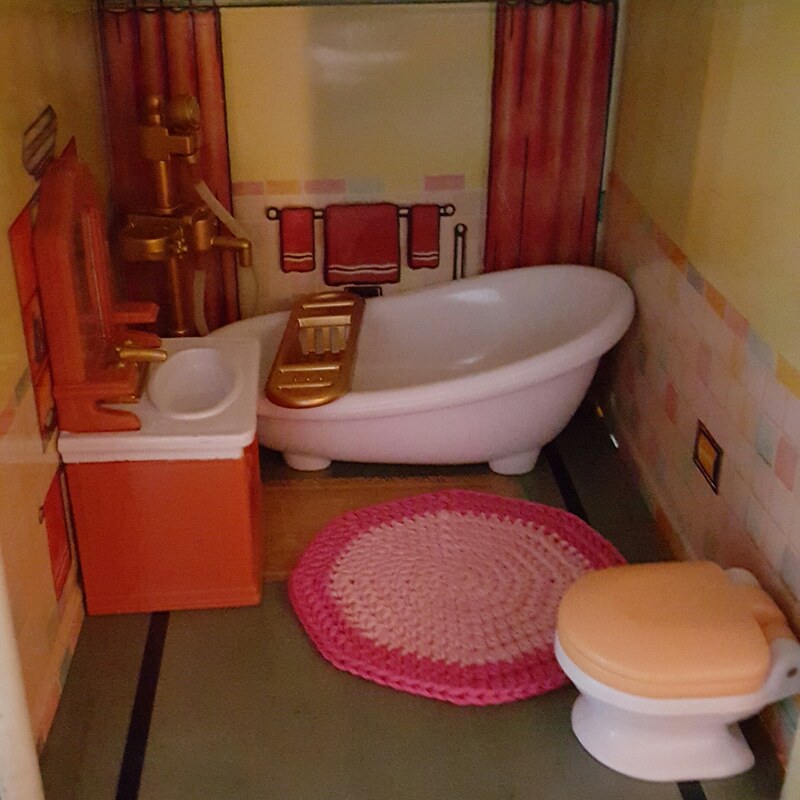 Brief Description: I love the 50s bathroom in this doll house. And I was really excited to crochet a tiny little pink *round* bath mat out of *just* the right shade of pink that would match the wall tiles. Alas, I think it's too big. What do y'all think? I wish you the best of luck on your job hunt, TheArtsyRaven. 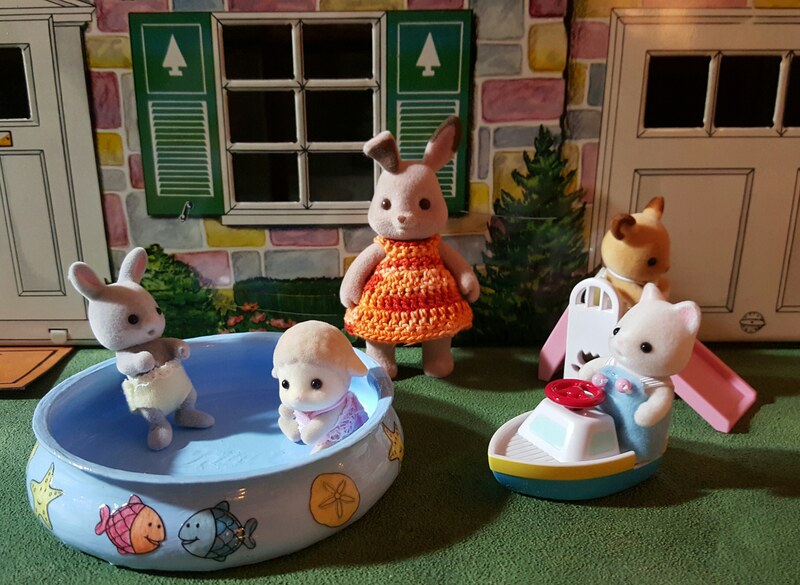 Brief Description: Who doesn't enjoy a cool dip in the Summer? I built this sweet little wading pool from the top of a Folgers coffee canister. I cut the top off and glued it onto a thick, Chinette paper plate and cut it down to fit a floor. I layered white and then blue coats over the red plastic (for 3 days). I found a bunch of water themed coloring pages online, shrank them, and colored them with colored pencils. I really wanted to add an octopus but realized there was no way I could cut out tenticles that small. I put a thick coat of modge on it protect it, and make it shiny. I had SO MUCH FUN building this for my little doll house from scratch!!!! I'm linking my pics from Instagram because of the picture problem. Hope this works. Brief Description: I love spinning because it's very relaxing. It soothes the soul. 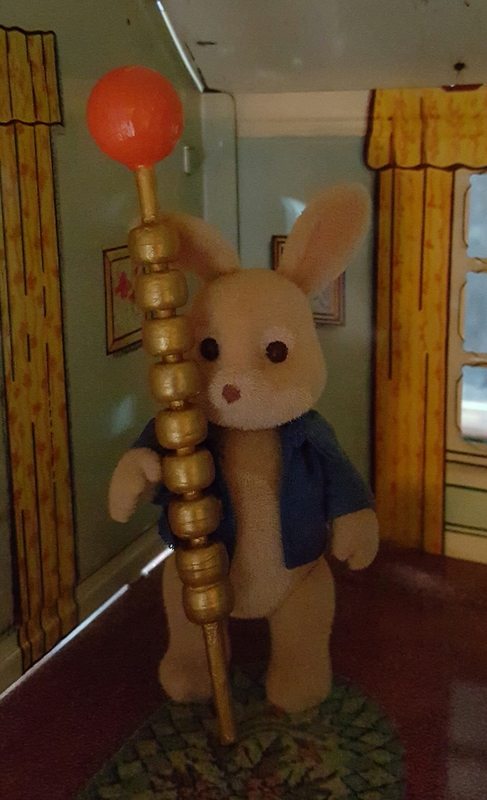 So I made Flopsy a drop spindle. She's already spun 2 hanks of singles, and is working on a third. Brief Description: A warping board makes measuring warp threads a breeze. It's a piece of equipment that makes any weaver giddy with excitement. I made a warping board for Netchez 17 years ago, and now I've made one for Flopsy. She's already wound up a warp, and is working on a second. Brief Description: A blending board is a wonderful, simple tool. Useful for blending fiber for spinning, this set comes with a blending board, a comb, and 2 lease sticks to help wind the fiber off the board. Flopsy has already busted out 5 art batts, and is working on a 6th. Brief Description: I can't live in a house without an easel. I love easels. Even when I'm not getting to paint. So when I came across a tutorial to make an easel for my dollhouse I had to. First I made one that was painted, like the tutorial, but decided I don't like painted easels. I like bare wood easels decorated with paint from the artworks created on them, so I built another one. Brief Description: For this class I enjoyed spinning red mohair art batt. Brief Description: In December Fred went back to trucking and more than once I wished I could give him a kiss, so I made a baby toy with his favorite colors, black and red. Brief Description: When I was growing up Granny and Mom always had a basket of yarn next to their chair with their knitting in it. 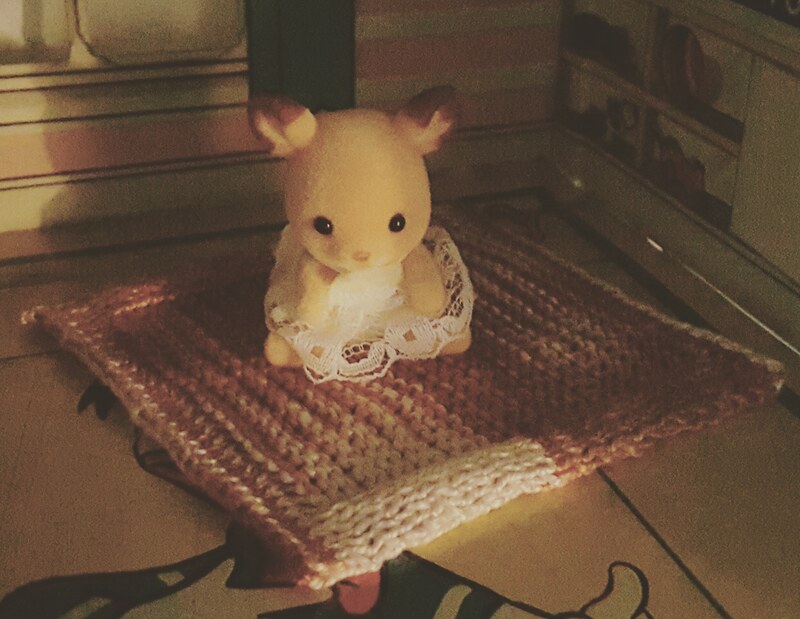 I made a little yarn basket for my dollhouse from a walnut, wound embroidery floss into hanks of yarn, and made a pair of knitting needles from toothpicks. I had to turn the yarn as I wound it, turn the walnut as I cut and sanded it, and turn the toothpicks as I cut them and carved them down so the beads would fit on them. 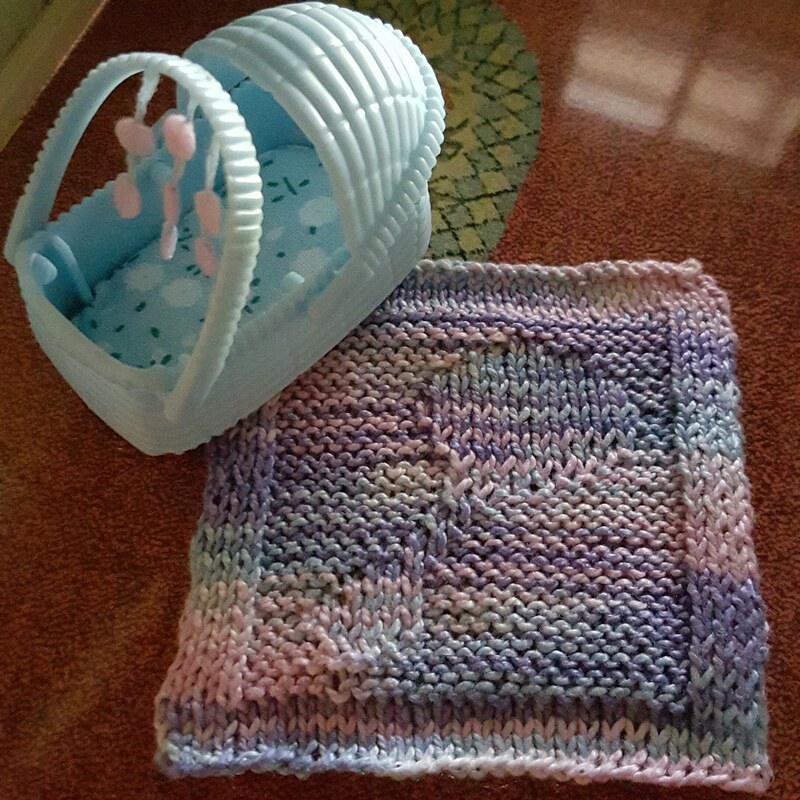 Brief Description: When I finished the yarn basket and knitting needles for Flopsy, AnnoyingLittleSister decided she needed a project to work on. I knitted her a project on toothpicks, transfered it to Flopsy's needles, and glued it in place. I'm still a beginner knitter so it being so small was difficult for me to control, and the toothpicks constantly stabbed my hands. I love the outcome, but the process was not fun. Brief Description: I've been working on this project for 2 semesters. It was the bending over to paint it that was so hard for me, but I finally got it done. Brief Description: A Welcome mat is very welcoming. I saw a cork dollhouse welcome mat on Pintrest that reminded me of the old couple in the white house in The Book of Eli that I loved. I don't have thin corkboard so I cut my mat base from a Chinette paper plate, and used the backside of it so the finished mat would have texture. Brief Description: I made this house number for another project but didn't turn it in in time, so it gets to be my May WIP. I cut the base from a Chinette paper plate. I painted it blue with white trim and free style painted the numbers. My lettering is in need of serious work. Brief Description: For this class I enjoyed making a black and white, beaded, baby toy. Brief Description: A side effect of sitting for 2 months is having a hard time getting up. The first 2 weeks after Will was born all I could do to get around was moon walk. Some days it's really hard to remember I am going to get better, so I made this motivational clipboard to help me keep track of my blood pressure and keep me going. Last week I was able to climb up on a stool. I was very excited.